As someone who considers themselves a big fan of Sonic the Hedgehog I can say with complete certainty that this is the greatest thing to ever happen to the series. Well, more like a close second. We all know the series has been one hell of a rollercoaster, with a rise, a plateau, then a spiral where you can’t decide whether it’s going up or you’re just upside down, then a down, and then a 90-degree rise of edgy greatness, followed with a shear drop that just keeps going until you get to a point where it’s kind of rising, but is balanced out by some weird werehog parts so it’s technically a straight line, but suddenly decides to go up and up then has a sudden drop that everyone was expecting but yet no one was prepared for. Oh, and no one is strapped in. Trust me it makes sense. Suddenly, however, the franchise has reached the highest peak of greatness that could only be beat by Snoop Dogg on the 20th of April without a single game being released. How is this possible? Well simple, all it required was a Twitter account accompanied with precisely zero fucks to give. While some people prefer to make people cry like anime fans on prom night, others prefer a subtle touch of bravado. We all know Twitter is supposed to be used with insulting random internet people, right? We also know that the best insults are the low-key ones, right? Well look no further than the Sonic the Hedgehog Twitter, who is without a doubt the king of subtle savagery. Insulting people and things is very much one of my favourite hobbies, if you didn’t know that you nerds, so there’s something magical about an anthropomorphic hedgehog throwing shade to everything and everyone that just warms my cockles. I believe that if you can’t handle people joking about you, you shouldn’t joke about others. The Sonic the Hedgehog Twitter decided that they’d beat everyone to the punch and just insult themselves, much to the dismay of the internet trolls and to the enjoyment to everyone else. The series has a rocky history, but that hasn’t stopped the Twitter from embracing their mistakes and using them to bring laughter to the masses. Kids these days love their memes, so it’s clear that the best way to appeal to them and bring Sonic truly into the 21st Century is by embracing the Dat Bois, the Doges and the Sanics. The Twitters ability to always keep up to date is astounding, and I for cannot wait for the next great meme so that I can see what Sonic does with it. Of course, who can forget the great Shia La “Just do it!” Beouf calamity of 2015? Which nabbed them an award by the way. When Is The Sonic/Deus Ex Crossover? The entire planet has only experienced a handful of bromances that could shatter mountains and end all wars throughout history. Jesus and his disciple Peter, Spock and Kirk, Watson and Sherlock, Han Solo and Chewie, and of course, Big the Cat and Froggy. None of them however come close to the bromantic relationship that is passionately burning between the Deus Ex Twitter account and the the Sonic Twitter account. We should be so grateful we are alive to experience this. I did not ask for this, but I’m sure as hell glad I got it. I know it’s the Sonic the Hedgehog Twitter, but I believe it is lacking in content involving the greatest character in the series. I know Big the Cat is great and all, but he cannot hold that damn fourth Chaos Emerald to Shadow. While doing my extensive and rigorous research for this review I only discovered one post that featured Shadow as the main subject. This is unacceptable and until this changes I am doing absolutely nothing and will continue to follow the account because of the entertainment it brings me. 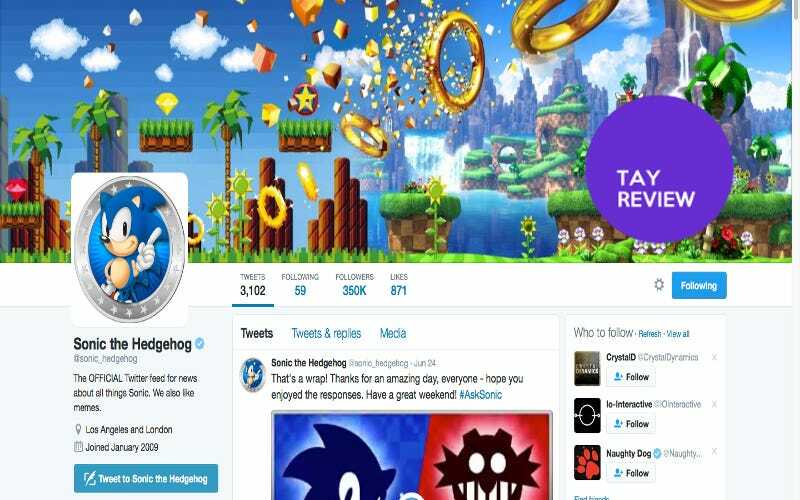 2015 will go down in the history books as the year the Twitter of Sonic the Hedgehog completely went off the rails. Some of the things it comes out with are stupid, ridiculous, ludicrous and absurd.